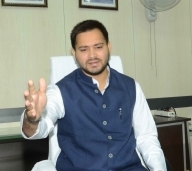 Patna, March 25 : Rashtriya Janata Dal (RJD) leader Tejashwi Yadav on Monday said the Lok Sabha elections will be a fight between the people and Prime Minister Narendra Modi. Former deputy chief minister Tejashwi Yadav said people have made up their mind to oust Modi. "If Modi as he claims is the chowkidar, the people are the thanedar. And the thanedar will punish the chowkidar for his failures and wrong doings," he said. According to Yadav, the Opposition Grand Alliance -- of the RJD, Congress, Rashtriya Lok Samata Party (RLSP), Hindustani Awam Morcha (HAM) and Vikassheel Insan Party (VIP) -- has a clear edge over the BJP-led NDA in Bihar. "Our support base is intact and the people will back us." Under the Grand Alliance's seat sharing pact in Bihar, the RJD will contest 20 and the Congress 9 of the state's total 40 Lok Sabha seats. The smaller parties share the remaining 11 constituencies -- with the RLSP fielding candidates in 5, and HAM and VIP in 3 each. The RJD will give one seat from its own quota to the Communist Party of India-Marxist Leninist (CPI-ML).